The TI-5029 is one of the early battery operated desktop printers sold by Texas Instruments. A similar model using a LCD instead the green VFD display was introduced with the TI-5024. Four years later the TI-5029 got a more stylish housing, view it here. 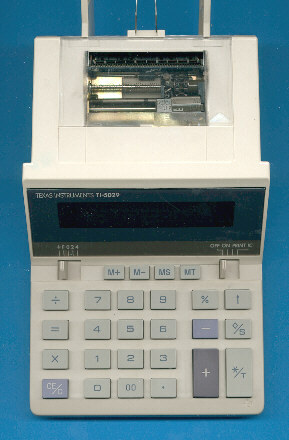 The TI-5029 is featured in the Texas Instruments Incorporated bulletin CL-900 dated 1986.